Richard Riot’s Branch showing the way..?? 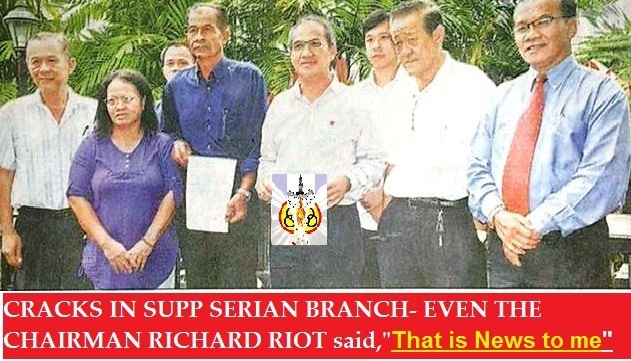 Deputy President of SUPP Richard Riot when quiized by the press have this to say,”I am neutral.Very simple.Neutral.Wong,I have no grudge against him,he has no grudge against me.We are friends. I prefer,to be very frank,you can quote me on this,I prefer to be neutral,I don’t (take) sides. But the survival of SUPP rests in the hands of ROS. I really hope it would not be deregistered. I don’t say I’m with Chin side or on Wong”s side. WELL some of the grassroots of his branch where he is the Chairman have other political agendas when they came out with this statement,”“We are gathering here to show our full, undivided and strong support for the leadership of Dato Sri Wong Soon Koh as we find the so-called charges hurled against our leader (Wong) baseless. There will be more surprises in store for the 54 year old party as it tries to wriggle out of this crisis.